The two sides shared 11 tries at Lockwood Park and it was the Yorkshiremen who came out on top in an entertaining game. 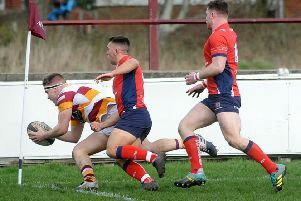 Although both clubs had appeared to be out of the promotion race before the game, Huddersfield’s triumph and second-placed Chester’s heavy defeat at Sedgley Park had given the Yorkshiremen a sniff of a play-off place. However, it was Fylde who began the game in splendid style. In the sixth minute, following a lineout 20 metres out from the Huddersfield line, flanker Harlan Corrie broke the defensive line with a powerful burst. He shrugged off opponents along the way to touch down near the posts with Greg Smith converting the try for a 7-0 lead. There was more of the same in the 14th minute as further good combination play ended with another Corrie burst to score under the posts with Smith again adding the extras. Huddersfield hit back quickly and decisively as, in the 18th minute, they pressed inside the Fylde 22 and Francis Entressengle forced his way over for the first of his side’s six tries, converted by former Fylde fly-half Chris Johnson. Play was pretty evenly contested running up to the half-hour with a Johnson penalty making the score 14-10 on 28 minutes. In the last 10 minutes of the half, Huddersfield cut loose and exploited some fallible Fylde defence. In the 31st minute, a Fylde clearing kick was charged down by lock Guy Borrowdale, who fed centre Mark Pease to score. Johnson converted to give Huddersfield the lead for the first time at 17-14. As Huddersfield continued to attack, Connor Wilkinson was sinbinned and Fylde paid for being a man short. Arthur Wilkinson benefited from his namesake’s actions to score his side’s third try with Johnson once again converting. 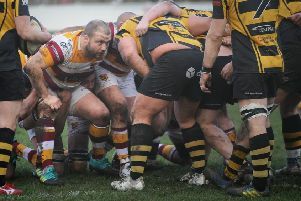 Fylde’s 10 minutes of mayhem were completed in the last minute of the half as Johnson broke clear, handed off a defender and scored a good try, earning a bonus point in the process. His conversion completed the half as Huddersfield led by 31-14. The start of the second half had an uncanny resemblance to that of the first. With Connor Wilkinson back in the action, Fylde reduced the deficit to 12 points at 31-19 thanks to Nick Ashcroft’s first try of the season. Three minutes later, and with Fylde pressing deep in Huddersfield’s half, Ashcroft crossed again from close range. This time Smith converted and Fylde were back within a score of the home side at 31-26 adrift. Just before the hour, however, and Chris Briers was adjudged to have deliberately knocked on to spoil the Huddersfield attack as they put pressure on the Fylde line. Referee Owen Taylor admonished the double blow of a yellow card to Briers and a penalty try to Huddersfield, who now led 38-26. Down to 14 players once again, Fylde struggled to keep out a rampant Huddersfield side. Their skipper Dickie Piper duly took advantage by ploughing over for his side’s sixth try. Johnson completed a perfect afternoon for himself by adding the conversion for a personal haul of 17 points. Fylde’s heads did not drop and they had the final word with a consolation try by Connor Wilkinson in the 76th minute. This was too little, too late as the final whistle blew but Fylde now face another keen challenge next Saturday. They welcome the division’s form team, old friends and neighbours Sedgley Park to the Woodlands for the club’s last home game. Park have put together a run of seven successive victories, and with pride at stake, it promises to be a superb Lancashire derby. Fylde: Wilkinson; Hadfield, Dowds (Forster 75), Briers, Carleton; Smith, Crampton; Horner, Gregory (Loney 21), Lewis (M Ashcroft 72), N Ashcroft, Garrod (O’Ryan 56, Torkington 72), Corrie, Vernon, Conner (Garrod 78).